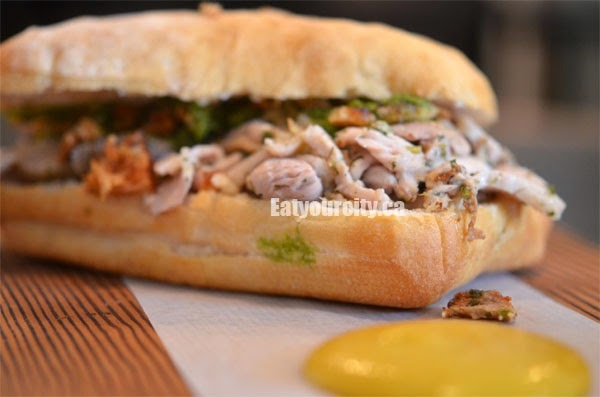 Eat Your City: Meat and Bread Vancouver, BC - tasty awesome sandwiches all from scratch! Meat and Bread Vancouver, BC - tasty awesome sandwiches all from scratch! Posted by While in town for a wedding last year, me and by boyfriend hunted down Meat and Bread to try out their all in house made sandwiches. It also doesn't hurt its been featured on Diners Drive-Ins and Dives on Food Network… There's 2 locations, the original one on Cambie, and one on Pender Street.. we went to the one on Cambie. onto the foooood! And returned the next day hahaha! This place was hopping! Line ups were out the door and everyone sits at communal tables after ordering and picking up your sandwiches. There is a large cutting board area with warming lamps at the front where the infamous Porchetta (pork rolled up with herbs and slow roasted for hours) is carved and chopped up.. tender bits of meat, crispy skin and all! We went with the day's specials - usually the Porchetta stays as its a fan favorite, but all other sandwiches get changed up daily. The Porchetta sandwich is piled high with moist flavourful roasted herbed pork pieces intermingled with crispy crunchy pork skin. Its simular to the crackling skin you'd find on Chinese BBQ pork... sooo rich and yummy!! I dipped it into some of their house made mustard (the yellow blob). Its generously dosed with some salsa verde which cuts some of the grease and adds a bright note to the sandwich. The bread surprisingly stays intact despite all the meat, sauce and good stuff dripping into it. The Ciabatta bread is made by Swiss Bakery… great job! (the same bakery that was the first to introduce Canada to the Frissant… known as the cronut in NYC). 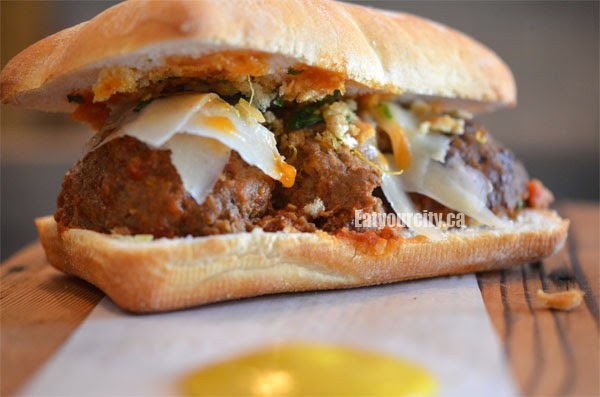 What we enjoyed even more than the infamous Porchetta was their Meatball Sandwich. Say what?! Yes.. their Meatball sandwich is NOT to be missed. Big juicy moist and seasoned tender meatballs smothered in a slightly sweet tomato sauce, topped with Parmesan petals… hubba hubba!! As well as a really tasty tex mex salad that had roasted corn, sweet bell peppers, beans, tomatoes and all sorts of yummy fixings. Overal, a great place to grab a tasty sandwich, soup and salad.. just arrive early as its busy and you want to have a sandwich, soup and salad for lunch!